Large numbers of customers can use the site's interactive maps. Clients can filter the hotel display by their criteria. Web visitors can drill down into individual hotel brochures and traveler reviews of the property. Nowadays it's easier than ever to plan trips or vacations using Web sites that collect information on destinations and offer the service of a traditional travel agentall online and available whenever needed. Successful travel Web sites offer many features to attract and retain customers, including virtual tours of resorts and hotels, links to local businesses, and realistic maps to assist discerning visitors in finding the absolute right spot to relax. Users type in the address or ZIP Code of a meeting to see nearby hotels on a local street map. VResorts.com was one of the first Web sites to provide virtual-reality tours of popular destinations and selected hotels and resorts, helping ensure that clients get a realistic impression of their accommodations and the surrounding areas. Combined with traveler reviews of thousands of hotel properties, VResorts.com makes every effort to provide its clients with a fully satisfying travel experience, thus building customer loyalty. After a few years of offering this virtual tour service, VResorts.com decided to enhance the booking experience even more. Because many people, especially business travelers, need to find a hotel near a specific location, it made sense to allow customers to search for and choose their hotels by selecting the location from a map. As in real estate, location is everything when it comes to picking the right hotel. Whether looking for a hotel within walking distance to a meeting or right by the beach, it is disappointing to find the hotel isn't where it was thought to be upon arriving at the destination. In addition, searching through dozens of text listings of hotels in a given city can be slow, tedious, and time consuming. 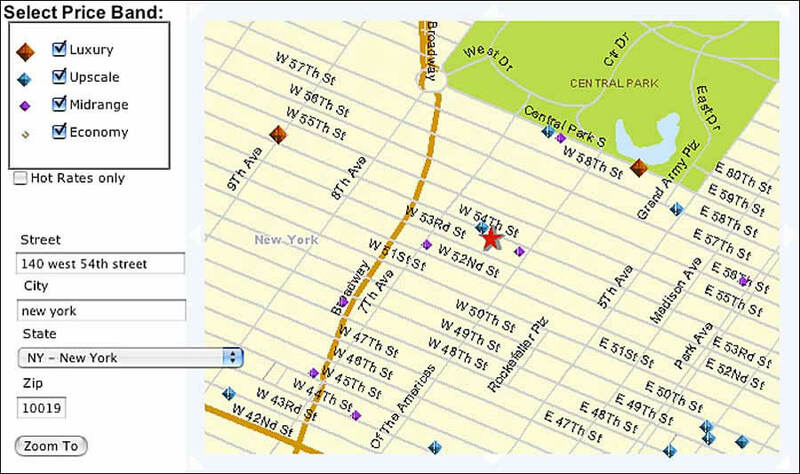 VResorts.com wanted to offer clients the ability to select hotels from a map that was more than a static page with dots on a street map. Giving its clients the ability to choose hotels on a map based on their own specified criteria would empower clients to control their travel experience. The need to find a solution that could offer this powerful browsing experience at the required scale within its growing business led VResorts.com to choose Esri. The load balancing capabilities of ArcGIS Server made it the obvious choice. 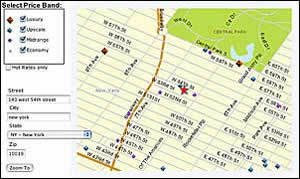 Working with Esri Professional Services and using the initial release of ArcGIS Server, VResorts.com developed an application that works as an interactive hotel finder. It displays hotels overlaying a local street map for more than 300 cities within the United States and Canada. The mapplet allows users to browse a U.S. map by city or search by entering a partial street address or ZIP Code and displays hotels that meet the criteria on the map. Clients can filter the hotel display by price range or based on amenities or hotel chain, zoom the map in and out, and determine which hotels are offering special discount rates. Says Doug Rosenberg, VResorts.com founder: "The VResorts.com mapplet leverages GIS into the entire shopping experience, making it quicker and easier to find the hotel you want, in the location you want, with the amenities you want." Web visitors can quickly identify hotel options in a given neighborhood and drill down into individual hotel brochures, which include traveler reviews of the property. Once they have made a decision, they can book the hotel online. "Absolutely all the information they need to find the ultimate vacation spot is right there at their fingertips," says Rosenberg. Hotel icons are color-coded by price range, and the display can be easily filtered and "decluttered" by price or specific amenities. For example, a user can request to view only midrange-priced hotels that have a pool and room service. Customers can also filter their display to show only hotels from a particular chain. For more information, visit VResorts.com or contact Doug Rosenberg (e-mail: drosenberg@vresorts.com).